Jane Albin creates in watercolors, oils and ink. A resident of Lewisburg Pennsylvania, Jane's subjects range from local street scenes to views of the Susquehanna River and surrounding countryside. She paints out of doors whenever possible. Jane won her first "Best in Show" at the annual Susquehanna Art Society in August 2016. In 2013, she won Artists' Choice and First Place awards in the Plein Air Camp Hill Quick Draw. 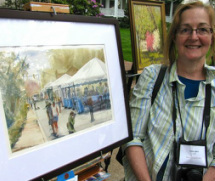 Two weeks later she won first place at the Gettysburg Festival plein air quick draw. She won the Plein Air Camp Hill Quickdraw again in 2014! Jane worked in fashion design and production after acquiring a BFA from Parsons School of Design in NYC. While working for Calvin Klein Inc., Jane met and married husband, Bob. They had two children and started their own children’s clothing company. Jane and Bob operated KatieCo. for 17 years. Today, they own and operate the Tawsty Flower B&B. Jane currently teaches adult watercolor classes at the Sunbury YMCA Arts Center in Sunbury Pennsylvania. You can find her most Thursday mornings and some Saturdays at Brushstrokes in Lewisburg.